QR codes are popping up everywhere for two reasons: they’re a smartphone’s best friend, and they’re a powerful marketing tool. These funky little square bar codes deliver a lot of information in a way that’s fast and easy for a phone to read. Plus, by providing a direct route to digital content that users actively engage with, they can instantly transform passive readers of printed ads into sales leads. While most people still don’t interact with QR codes (either they don’t understand what they are, don’t have a smartphone, or simply tune them out), more and more people do. And because they take up very little space on an ad, marketers see them as a low-risk, high reward opportunity to engage with the growing mobile audience. Today’s Boston Sunday Globe featured a QR code on the front page to go along with coverage of this evening’s Oscar awards. 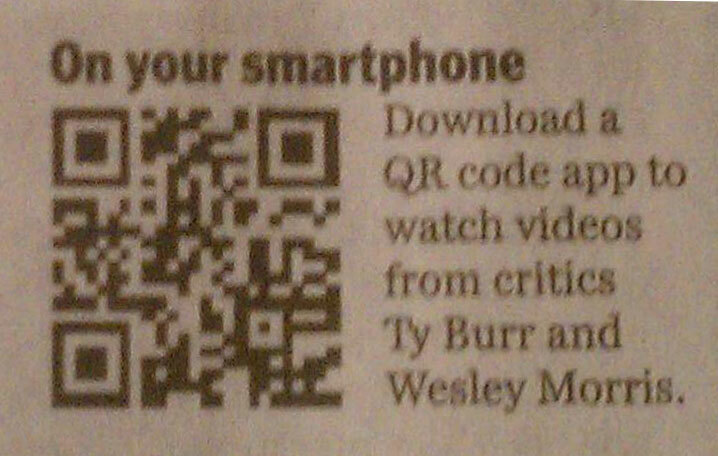 When scanned the code takes the user to a video clip with Boston Globe film critics Ty Burr and Wesley Morris providing a commentary of their pics for Best Picture. The use of the code in this context is not particularly earth-shattering, but what makes it notable is all the things the Globe has done right integrating the code into the story – the code has prominent placement, is printed at an appropriate size and density that makes it easy to scan, takes users to a mobile-friendly landing page, and provides the user with practical context (there’s no mystery why it’s there). If you’re reading this, you probably know a bit about mobile marketing already. You may have seen a QR code and wondered if it could work for an event you’re planning. Or maybe you asked yourself whether mobile sites really matter – not just from a functional perspective, but for growing your business. At Qfuse, we live and breathe this stuff, but we started out with a lot of the same questions. Did QR codes really work? Why were so many of them so tacky?